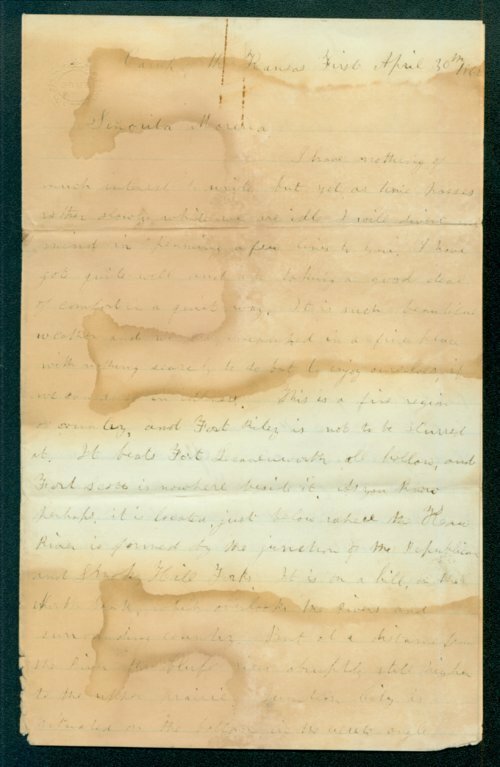 A letter written by Leigh R. Webber from Fort Riley, Kansas, addressed to "Senorita Morena," or Miss Brown, a daughter of John Stillman Brown, a Unitarian minister who lived west of Lawrence. Webber first praises Fort Riley and describes the surrounding landscape. He goes on to describe fort life, including equipment and food. He also discusses his thoughts on the troops' future plans to march to New Mexico and his efforts to learn Spanish.